Colors of light and colors of matter operate somewhat differently from each other. Colors of lights are additive, but colors of material pigments are subtractive. Of course, they both are conditioned by the biology of the human eye and cultural preferences. Above I have tried to create a synthesis of sorts for both types, and whereas it is pleasing in some ways, it is lacking in others. White light is combined red, green, and blue light, and combinations of green and red light yield yellow light, combinations of red and blue light yield magenta light, and combinations of green and blue light yield cyan light. 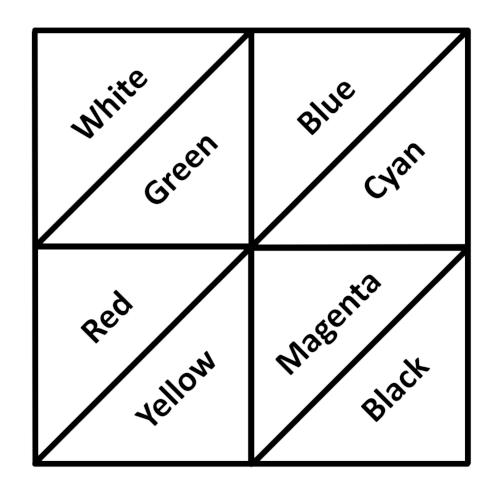 Similarly, black is mixed yellow, magenta, and cyan pigments, mixing cyan and magenta pigments produce blue pigment, mixing cyan and yellow pigments produce green pigment, and mixing yellow and magenta pigments produce red pigment. This entry was posted on March 26, 2019 at 8:10 AM and is filed under eightfolds, fourfolds, Physics, Science. You can follow any responses to this entry through the RSS 2.0 feed. You can leave a response, or trackback from your own site.